San Diego Chargers tight end Antonio Gates attempts a stiff arm, in the Chargers 13-6 win over the Oakland Raiders on Sunday. Courtesy of San Diego Chargers Facebook. 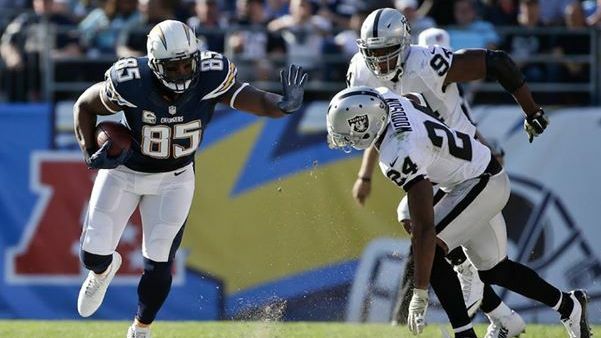 The San Diego Chargers snapped their three-game losing streak Sunday, when they defeated the Oakland Raiders, 13-6, at Qualcomm Stadium. Quarterback Philip Rivers got off to a hot start as he hit wide receiver Malcolm Floyd for 22-yard touchdown pass on the team’s second play from scrimmage. That would be the only touchdown from either team for the rest of the game, though. Rivers struggled to get the offense going coming off a bye week, and threw for 193 yards — his second lowest total of the season — while being sacked twice. He was also seen visibly upset on the sideline all game, because of miscommunications with coaches and wide receiver Keenan Allen. On top of the miscommunications, Rivers was also hit hard several times in the rib area and got his knee rolled on by a Raiders defensive lineman. 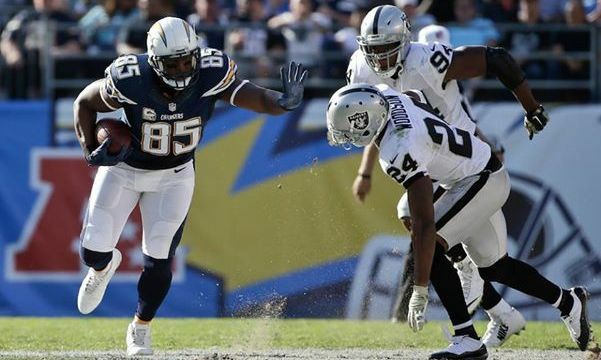 While he would not leave the game, tight end Antonio Gates knew how severely his quarterback was hurt. In the absence of Rivers having a quality game, the San Diego defense stepped up, aided by the return of linebackers Melvin Ingram, Manti Te’o and Jeremiah Attaochu from injury. The Bolts defense recovered a fumble in the first quarter, collected two sacks (Kavel Connor, Attaochu) and forced the Raiders to punt nine times. The defense held the Raiders to two field goals, one in the first quarter, and the other in the fourth quarter. Oakland’s defense also did a solid job of stifling the Chargers offense, but the Bolts were able to pick up two field goals from kicker Nick Novak, which were the deciding factors of the game. Novak’s franchise-record streak of 32 consecutive field goals was broken up though, when he missed a 48-yard attempt in the second quarter. Thanks to a loss from the Denver Broncos on Sunday, the Chargers (6-4, 2-2) move to one game back for first place in the AFC West. San Diego will square off against the St. Louis Rams (4-6) next Sunday, at home, and kickoff is scheduled for 1:05 p.m.